While we’ve been building PreForm 1.0, meeting Martha Stewart at CES, and buzzing about our upcoming events (stay tuned! ), our users have been printing their hearts out. Ann Sidenblad prepped and printed this Medusa-inspired character print, conceptualized by Tim Lamb and modeled by Mickaël Riciotti. Make sure you also check out her creepy creature model, designed by Michael Conelly and modeled by Anastasios Gionis. Her forum posts are full of process shots! Mattia Mercante shows off the combined powers of 3D scanning and 3D printing with this model of the Guiseppe Sirtori monument in Milan. Kristof Vandebroeck experimented with weighting and hollowing out different portions of this little dude; in the end, he’s self-supporting and stands up on his own. Check out the forum post for Kristof’s process shots and more details on the weight distribution of the figure. 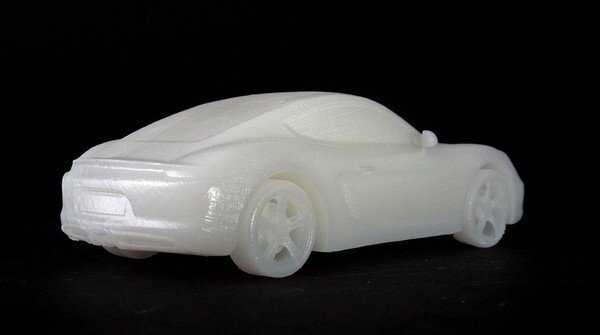 For a brief and glorious few weeks, Porsche (yes, that Porsche) provided a full-sized .STL of the Porsche Cayman S. After some tweaks, our users (and one of our Formlings) proved that you, too, can download a car. Finally, David Clark designed a custom iPhone dock for his wife’s LifeProofed phone. He’s planning on making the design available on Thingiverse — let him know if you want it now! The future holds wonders for Formlabs and for you — keep printing and posting! Users waiting for their Form 1s to ship, please feel free to get in touch and we’ll send you an update.